It would be hard to overstate how resilient the theory of general relativity has been. In its hundred-plus-year history, it’s managed to predict things far beyond the capabilities of 1910s experiments, and it withstands every new test scientists throw at it. This time around, researchers flipped typical experiments on their head. Often, scientists look at how much an object bends the fabric of space itself to determine its mass. A new experiment reverses that idea, using an already-calculated mass to see whether the predictions of general relativity held up. Spoiler: They did. But interestingly, the finding could spell trouble for physicists hoping to solve certain other mysteries of the universe. That mass can warp of the shape of space itself is a fundamental part of general relativity. Scientists have observed it repeatedly by looking at how heavy objects in space, like clusters of galaxies, warp the light passing around them. Scientists first spotted this during a 1919 solar eclipse, during which the blacked-out sun appeared to have slightly shifted the position of background star. They continue to spot this phenomenon today, and now know that heavy foreground objects can warp light so much that background stars and galaxies appear like a ring in the sky. The researchers used one of these “Einstein rings” to perform their experiment. 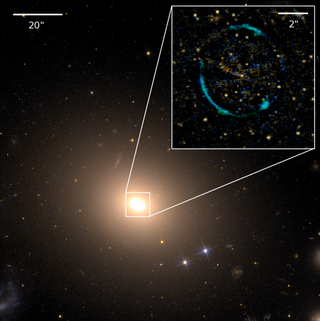 They calculated the mass of the foreground galaxy, called ESO 325-G004, by measuring how its stars moved. Then, they calculated the curvature of the Einstein ring surrounding the galaxy to determine how much it deformed the surrounding space. The property to describe mass’ curving effect is called “gamma,” and the theory predicts it should be equal to 1. The scientists calculated it at .97, give or take .09 for potential sources of uncertainty, according to the paper published in Science. In other words, their observation agreed with the theory quite well. Other researchers were excited about Collett and his team’s work. “The nice thing here is that by giving detailed observations of this one system, Thomas has been able to do a test of gravity on the scale of a galaxy which is under-explored,” Tessa Baker, post-doctoral research fellow at the University of Oxford, told Gizmodo. Why do we need to keep testing Einstein? Remember that the universe is expanding, and that expansion is accelerating. This is caused by some yet-to-be explained force called dark energy. Theoretical physicists are looking for some explanation for this dark energy, and some have surmised that perhaps there’s a grander theory where the curvature of space-time differs for bigger things. But, at least for this galaxy, general relativity holds, and grander theories that tweak the gamma value too much won’t work. It’s like being lost in the middle of the city and being told a few directions not to go in order to find your way. Every time general relativity passes another test, theorists get a little less lost. There are limitations, of course. Collett calls out in the paper that there’s modeling that can introduce uncertainty, such as from discrepancies in how stars move in theory versus how they move in the Milky Way. And this is just one galaxy—some theories won’t be ruled out by a single measurement, said Baker.